Last week, women filled the streets to demand equal rights, women’s rights, civil rights, employment rights, social rights, human rights, and power. Indigenous women in Ecuador linked arms across the Atlantic with women in Turkey who, in turn, linked arms with women in South Sudan who linked arms with women in the Philippines who linked arms with women in Australia, and all points between and beyond. In Pakistan, women organized the Aurat March, or Women’s March, “a revolutionary feat for Pakistan”. Initially planned as a single march, by March 8, women across Pakistan were on the streets, marching, resisting misogyny and patriarchy. Women in Spain called for a 24-hour feminist strike, una huelga feminista, and the State shut down. More than five million joined the feminist strike. In Spain alone, women marched and refused to work and stopped work in over 120 cities. The Spanish feminist strike was a historic first for Spain … and beyond. On Saturday, March 11, in Tunisia, women marched in another historic first, a march for women’s equality in inheritance rights, a first-ever demand not only for Tunisia but for the Arab world. In Tunisia, equality is a right, not a favor. 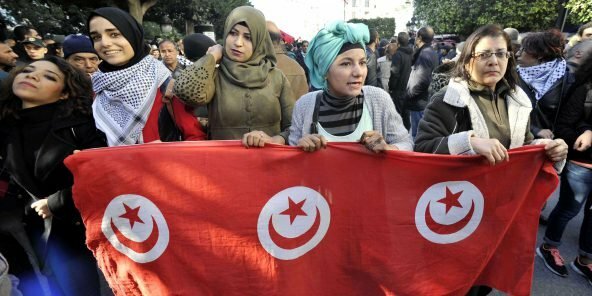 On Saturday, in Tunis, women chanted, “Moitié, moitié ; c’est la pleine citoyenneté!”; “Pour garantir nos droits, il faut changer la loi!”; “L’égalité est un droit, pas une faveur!”. “50-50 equals full citizenship!” “ To guarantee our rights, we have to change the law!” “Equality is a right, not a favor!” As with the feminist strike in Spain, in Tunisia, women explicitly framed their action as a feminist intervention into patriarchy. As with the marches and actions everywhere, in Tunisia, the women understood their march to be local, national, regional and global. The immediate issue was inequality in inheritance, where men inherit twice as much as women. The women insisted that their action occur in a historical context, a historical context that encompasses the future as much as the past. In January 2018, Tunisian women mobilized, protested and ignited the anti-austerity protests, under the banner, “What are we waiting for?” “Qu’attendons-nous?” “فاش نستناو ؟” In March, women are again filling the streets; rocking the nation; demanding autonomy, equality, power; seizing the moment. Today, as ever, women are Tunisia’s revolutionary guards.